You are here: Home / Blog / Join us at the 2018 Wilderness Risk Management Conference! 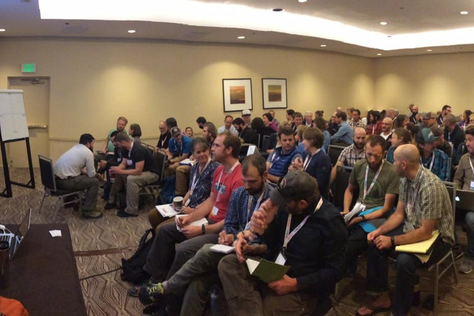 Each year, The Mountaineers brings a handful of our volunteers to the Wilderness Risk Management Conference. Learn more about this year’s conference – held on October 3-5 in Portland, OR – and apply to attend as a representative of The Mountaineers! How do industry trends affect, shape, and impact our programs at The Mountaineers? If this is a question that you've ever considered – and a conversation that you're interested in being a part of – we invite you to join The Mountaineers at this year's Wilderness Risk Management Conference in Portland, Oregon. The Wilderness Risk Management Conference, or WRMC, is an annual gathering of outdoor professionals that creates an unparalleled opportunity for experts from various facets of the risk management world – practitioners, administrators, insurance providers, wilderness medical professionals, equipment manufacturers, and attorneys – to convene in one place and share knowledge. Offered by NOLS, the spirit of the conference is captured in the WRMC Tenets and can be summarized as: a community of outdoor professionals sharing practices, learning, and experience in a collaborative environment. We’re lucky that this year’s WRMC will be close to home, just down the road in Portland, Oregon! The conference will take place on October 3-5, 2018, and we would be thrilled to have strong volunteer representation from The Mountaineers. We've reserved seven slots at the 2018 WRMC for our volunteers, paid for by The Mountaineers. We invite you to apply for one of these spots, attend on behalf of The Mountaineers, and bring what you learn back to your branch and our organization! We hope to have representation from each branch. Please complete an online application no later than August 10 to receive full consideration! Staff will support our branch chairs to make final selections by August 15. Please note: Mountaineers representatives will receive complimentary conference registration ($635 value), but must arrange for their own travel and lodging accommodations. If travel and lodging are cost-prohibitive, please consider applying for a Leadership Development Fund grant to cover those additional expenses. Alternatively, all members are invited to register today, at their own expense, and ensure themselves a seat at the table. Early bird registration is available until July 20, and pricing goes up again after August 31! What’s in this year’s line-up? The WRMC is a melting pot of expertise, and a junction where industry leaders converge to discuss trends, standards, and best-practices. If you want to learn more about the changing views on wilderness medical practices, hear about recent developments in legal cases pertaining to the outdoors, explore how technology can be used to mitigate risk, collaborate with others on fostering a culture of incident reporting, or discover better ways to design and deliver trainings - then the WRMC is a great fit for you! In addition to the physical risks that many of us associate with risk-management, the WRMC is also designed to help attendees learn about managing two other types of risk: organizational risk (things that threaten your business) and emotional risk (the emotional well-being of participants in outdoor adventures). This year, we are also excited to offer two of our attendees complimentary attendance to a pre-conference workshop called Building a Foundation for Understanding Inclusion on October 2-3. The Mountaineers is committed to improving the diversity, equity, and inclusiveness of our programs as a part of our Vision 2022 strategic plan, and we know that it is important to support volunteer involvement in this initiative. We hope that you will consider joining us for this additional session! Click here for a full schedule, including presentation descriptions and presenter bios! Please contact Sara Ramsay, Volunteer Development Manager, with any questions about attending this year’s Wilderness Risk Management Conference in Portland. Attending the WRMC is an outstanding opportunity to gain new insights and skills that will benefit you, your branch, and The Mountaineers as an organization. We hope you’ll apply to join us!